As we noted in the last chapter, there are wireless functions that take place on other layers than the Physical layer. The text tells us that all WLAN features take place on the PHY (Physical) layer and the MAC layer, which is actually part of the Data Link layer. The text begins its discussion of Layer 2 by defining a service set as all the devices that are associated with a wireless LAN. This is not very enlightening, so let's see three examples of service sets. Each of them has specific terms, definitions, and acronyms. Basic Service Set (BSS) - One or more wireless devices, called stations, that are served by one access point. The AP should be connected to a network, but the definition does not require it. Each BSS is actually given two identifiers. The Service Set Identifier (SSID) is the ID that is assigned to this WLAN. It may or may not be broadcast. It is typically an alphanumeric string assigned by the administrator of the LAN. The Basic Service Set Identifier (BSSID) is the MAC address of the AP. It is not set by the administrator. It is hard coded by the manufacturer of the AP. Frames transmitted at Layer 2 use MAC addresses to identify their source and destination. The BSA of an 802.11a WLAN is the smallest. The BSAs of 802.11b and 802.11g WLANs are about the same size. 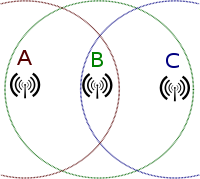 The BSA of an 802.11n is the largest of the four types mentioned in the text. Factors that diminish service on a WLAN: obstructions to the signals, too many users, users consuming large parts of the bandwidth, and distance from the AP. The text recommends that the number of users on a BSS WLAN be limited to between 15 and 25. It warns us that users at the outer range of the AP will have slower data rates due to dynamic rate switching. Extended Service Set (ESS) - This method addresses the limit on the number of users by increasing the number of APs and connecting their WLANs. An ESS is defined as two or more BSS LANs that connect to each other. This is the basis of a cell system, and it allows a station to roam from one cell to another. The illustrations in the text agree with this discussion on a site that sells practice equipment for Cisco certifications. Their illustration shows the concept shown on page 202, that the individual BSS WLANs should be linked into one common network. The text discusses a problem with roaming from one cell to another. In the system shown on page 201, the cells are part of the same network, which allows roaming from one cell to another, keeping the same IP address for each station. This is Layer 2 roaming. All devices are in the same network. The illustration on page 202 shows two switches that join at one router. The system administrator has set up separate subnets on each AP, which means they are different networks, which means that a station roaming from one cell to the other will need a new IP address in the new cell. This will cause the station to drop off the first network, to have to join the second network, and to lose connection with anything the user was doing on the network. This can work, but users have to know it is going to happen or they will be very unhappy. This is Layer 3 roaming. Devices are in different networks. A workaround for the problem of dropping off a network in Layer 3 roaming is explained on page 202. The roaming station uses Mobile IP, which assigns it a permanent IP address on its home network. That address communicates with software called a foreign agent that acts like a proxy server for each new foreign network. In a sense, the IP stack has two addresses at any given time: the one on the station's home network, and the one on the current foreign network, and the foreign agent acts like a router between the two. Another key term is the Distribution System (DS) that is the system the BSS systems in an ESS use to communicate with each other. It determines whether a frame in the system needs to be sent across a wire, to another BSS, or to a station on a BSS. The text explains that it is actually software on each AP. If the APs in an ESS system are connected by wireless means, then they use a Wireless Distribution System (WDS). Independent Basic Service Set (IBSS) - This type of system has no access points. It is more like a peer-to-peer network between some number of stations. This is also called an ad-hoc network. This kind of arrangement could take place between stations in one of the other types, but it would not be needed in those cases. The key thing about this system is that it only uses stations, and it does not connect to another network. Other texts tell this story differently, saying that this kind of service set can act as a bridge between the other types. Our text does not mention this possibility. The chapter continues with what it tells us will be a discussion of frames, but it gives us more background on the internal processes of the ISO-OSI model first. One bit of trivia is about the passing of data from one layer to another. Data is passed from one layer to the next in inbound and outbound traffic. The discussion in the text is about an outbound message/request. Each layer receives data units from the layer above it. A Service Data Unit (SDU) is a unit that has been received, but not processed to pass to the next layer yet. A Protocol Data Unit (PDU) is a unit that has been processed to pass down to the next layer. Different things are done on each layer to process these data units, but the layers have one thing in common. They each encapsulate the data units that they receive. This means that they wrap their own kind of header and footer around whatever they received from the upper layer, in preparation of handing it to the next lower layer. It is as though mail was being passed down the network layers, and the mail room on each level puts each outgoing message in a new, bigger envelope before delivering it to the mail room at the next lower layer. In this way, a layer receives an SDU and prepares it to be a PDU that it will hand off to the next layer. That PDU is viewed as an SDU by the next receiving layer, where is it wrapped in a new header and footer. It becomes that layer's PDU, and it is handed down to the next layer. For incoming messages, the process is reversed. Incoming messages are unwrapped, processed, and handed up by each layer in turn. This is illustrated in the figure on page 205. The book should have made it clearer that the data is being sent by one device and is being received by another. The text tells us on the next page that 802.11n has a new feature. It can aggregate data units that are being sent to the same device. This means that the service data units may be combined into one unit, providing that they are being sent to the same other device, and providing they are small enough to fit in one Aggregate MAC SDU. These SDUs can be aggregated in turn, which makes them Aggregate MAC PDUs. The text changes the subject just a bit on page 207, telling us that there are differences between the frames used in 802.11 systems and frames used in 802.3 (wired Ethernet systems) that they must interact with. We are reminded that most wireless systems operate in infrastructure mode, which means that they connect to a wired system. To understand a problem that occurs in many systems, you need to know that frames are limited to different sizes in different kinds of networks. The measure of size the book recommends is the MTU: the Maximum Transmission Unit. This is a measure of the entire frame, including the header, footer, and data portions. fragmentation - Frames can be broken into pieces that will fit the rules of the network being used. Each piece can be wrapped in the appropriate frame material. They are numbered for reassembly by the receiver. jumbo frames - All devices on the network can be set to allow frames that range from 1500 bytes to 9000 bytes. These are jumbo frames. Note that they are still smaller than the aggregate PDUs. lowest common denominator - In this strategy, wireless devices are configured to limit their frame sizes to 1500 bytes. The text tells us this is often a default setting for wireless devices. Moving to the bottom of page 208, we are reminded, painfully, that a Layer 2 frame will be received by Layer 1 and will be wrapped in an appropriate frame at that layer. The text discusses three types of MAC frames: management frames, control frames, and data frames. Management frames - These are used to set up and maintain connection between stations and APs, and between stations in an IBSS. There are several types of management frames, and each has a different purpose regarding sessions. I have reordered the list below. I hope it makes more sense. Data frames - These are the frames that actually carry data. They perform the business that frames were invented for. The text points out the four address fields in a data frame on page 210. They hold the BSSID, the destination address, the source address and the transmitter or receiver address. The third major part of the chapter discusses actual functions of a wireless LAN on the MAC sublayer. passive scanning - This type of scanning looks for broadcast advertisements of services from an AP: beacon frames. See the information about what is in a beacon frame in the notes above. The text explains that joining a WLAN involves authentication and association. For another discussion with some pictures, we can visit this page on the Cisco web site. Open System Authentication - This is the default method. The station sends an authentication request that identifies it. The AP receives the request, believes it for no good reason, and allows the station into the LAN. The only thing the station needed to know was the SSID of the AP. This method has no real security, and should not be used on systems where security is an issue. Another author describes the process a bit differently from Mr. Ciampa's description. See this page in Google books. Shared Key Authentication - This method actually includes security. The AP has a stored encryption key. The station trying to authenticate must use that same key in order to be authenticated. The method shown in the text is more involved than the general user ever sees, but it is accurate. The station requests to authenticate. The AP sends a block of text to the station. This is the challenge text. The station must encrypt the challenge text with the shared key and send it to the AP. The AP examines the received encrypted text and compares it to its own encrypted version of the text. They must match for the station to be authenticated. The AP sends an authentication frame to the station, either letting it in the network , telling it that it failed, or locking it out. association - Authenticated stations are not completely in the network yet. They still need to associate. In the association process, the AP assigns an ID to the station, reserves memory space for it, makes the station part of the AP's wireless LAN, and sends information about communicating with it to the station in an association response frame. The last major topic in the chapter covers stations attaining actual media access, and being able to transmit across the WLAN. The author teases us by saying that there are three procedures. As usual, each of them has variations. Distributed Coordination Function (DCF) is an umbrella over two rather different procedures. Carrier Sense Multiple Access with Collision Avoidance (CSMA/CA) - This may be familiar to you if you already know about Carrier Sense Multiple Access with Collision Detection (CSMA/CD) that is used in most wired Ethernets. They both start the same way: They listen to the medium for carrier waves. That's the Carrier Sense part. If no one is transmitting on the medium at a given moment, it is available for use by any station on the LAN. That's the Multiple Access part. The text explains that CSMA/CD does not work for wireless systems, since the collisions are not evident. On a wired system, the stations transmit and listen simultaneously, so detection of collisions is easy. In a wireless LAN, an RF transmission from a particular station prevents that station from listening to that frequency simultaneously. Also, only collisions that affect the AP are important, unless the system is operating in ad-hoc mode. Stations that are widely separated may not be able to sense a collision that occurs only at the AP, as illustrated on page 218. This collision was caused by two stations that cannot sense each other's transmissions. This is why it is called the hidden node problem. So, having explained wired Ethernets and why CSMA/CD won't work for a wireless Ethernet (yes, it is still an Ethernet), the text begins to describe CSMA/CA. The author tells us that most collisions on either kind of system occur at a particular time: every time a station ends a transmission. Other stations that have been waiting for the channel will attempt to send at that moment. Oh, dear. CSMA/CA handles the problem by requiring all stations to wait a random interval at the end of another station's transmission. Of course, it would have been too easy to stop there, so it is a bit more complicated. The WLAN will have a time interval defined for all stations called a slot time. The text tells us that the slot time for an 802.11b WLAN is 20 microseconds. The stations calculate a random number when they hear the channel is open, they multiply that random number times the slot time, and that is the number of microseconds they wait before contending for access to the channel. The text explains two more features. Explicit acknowledgment, or frame acknowledgment, requires that when a station or an AP receives a frame successfully, that an acknowledgment frame is returned to the sender as a receipt. If the sender does not receive an acknowledgment, failure is assumed and the frame would be retransmitted. The other feature is a variation used in 802.11n. In this case, block acknowledgments are sent when stations receive aggregated frames. This avoids having to send an ACK for every single frame. Request to Send/Clear to Send - This is an alternative to the CSMA/CA system. The AP acts like a scheduler for station transmissions. When any station wants to send a significantly long transmission, it sends a Request to Send frame to the AP, which includes the time the station estimates it will need for the transmission. In theory, all stations on the WLAN will receive this message as well, and be aware that it will eventually take place. The AP considers the various requests it receives. When it decides that it is time for a request to be granted, the AP sends a Clear to Send frame to a requester, allowing it to begin its long transmission. The text explains that this kind of overhead is burdensome if it is done for every transmission in a WLAN, so there is a loop hole. The standard allows the setting of an RTS Threshold. This is a period of time. If the estimated time to transmit is lower than the RTS threshold, the station wishing to transmit simply tries to do so in the next quiet moment. Obviously, this loop hole leads to another technique. If a message can be fragmented so that each fragment falls under the RTS threshold, the station wishing to transmit such fragments is free to do so. The text mentions that fragments need to be numbered for reassembly by the receiver, but this is true for any transmission. Fragmentation may be used with or without and RTS/CTS system to improve throughput. CTS-to-self - When an 802.11g station receives a CTS frame, it sends that frame to itself, but it does so in a frame that 802.11b stations will understand. Then it sends the transmission it requested time to send. HT Dual-CTS Protection - This is used when you have 802.11n devices in a mixed environment. The text explains that the AP will send two CTS frames, one for the 802.11n device, and the other for any other devices in the environment. The text discusses intentional gaps left between frame transmission. They are used for immediate responses, like ACKs, and management messages. The time gaps are called interframe spaces (IFS). This hurts my head. They should have just been called ISs. This material gets very detailed and harmful to human brains, so we will move on to page 223. The text explains that contention based systems are just one kind of network. Another type, although never popular, uses polling. A device on these networks acts like a scheduler, which controls all traffic on a part of the network. In this case, the scheduler asks each device, in turn, whether that device has anything to transmit. If so, the transmission takes place. If not, the next device on the list is asked. With PCF, each AP acts as the point coordinator for its WLAN. PCF is an optional method. I suspect most system admins would consider it daunting. The alphabet soup is getting deep on this page, so let's take just one more tablespoon on the next page and call it good. Hybrid Coordination Function (HCF) is the other optional method that is an alternative to DCF. This method allows us to assign levels of priority to different types of wireless traffic. That's enough for this chapter. Remember to breathe. Get up slowly and walk around for a bit. Watch out for traffic. Smell some flowers, if you can.